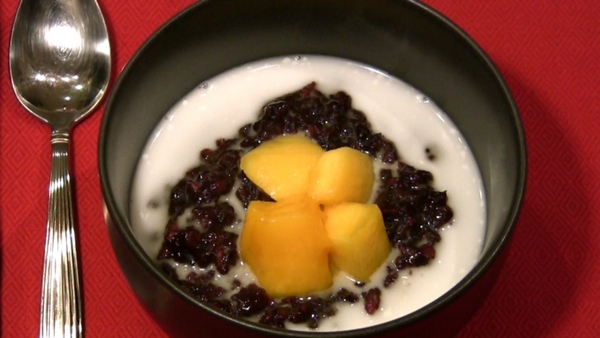 Serve Black Rice Pudding as either a dessert or a Breakfast Meal. Delicious with cubed mangoes or blueberries. Soak black rice in 5-6 cups of hot or boiling water for 6-8 hours. Using 3 1/2 cups of this water, bring the rice and pandan leaves to a boil in a sauce pan and simmer on low for one hour, stirring occasionally so that it doesn’t stick to the bottom of the pan. Rice should be soft and sticky. While rice is still warm, stir in 1/2 cup palm sugar (purchase from an Asian food shop; you may need to grate it as it will be a hard, brown sugar-like block) or the natural sugar, and the vanilla. Serve with coconut milk and top with mango. Slow Cooker method: Place in cooker before going to bed and have breakfast ready when you get up! Before going to bed, put black rice, salt and water into a slow cooker/crock pot. Turn on low and cook for 8-9 hours. In the morning, stir in 1/4 cup of agave nectar and 1 teaspoon of vanilla. Top with fruit of your choice and stir. Divide into four portions and serve with almond milk.